New York, NY (August 1, 2018) – The New York Stem Cell Foundation (NYSCF) Research Institute today announced a strategic partnership with Korean firms ToolGen, Inc., and nSAGE, Inc.. 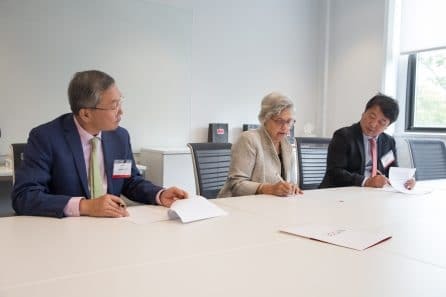 In a Memorandum of Understanding, the organizations agreed to collaborate in the development of innovative therapeutics by leveraging cutting-edge gene editing and stem cell technologies. NYSCF will be a strategic partner to a new company being created for this purpose by ToolGen and nSAGE. The NYSCF Research Institute is a pioneer in stem cell technology, having developed the first automated robotic platform for reprogramming adult cells such as skin cells into induced pluripotent stem cells. nSAGE is a laboratory specialized in advanced stem cell engineering that will play a crucial role in the research planned among the parties. ToolGen is a leading biotech company focused on the revolutionary development and application of CRISPR-related gene editing technology. The New York Stem Cell Foundation (NYSCF) Research Institute is an independent non-profit organization accelerating cures and better treatments for patients through stem cell research. The NYSCF global community includes over 150 researchers at leading institutions worldwide, including the NYSCF–Druckenmiller Fellows, the NYSCF – Robertson Investigators, the NYSCF – Robertson Stem Cell Prize Recipients, and NYSCF Research Institute scientists and engineers. The NYSCF Research Institute is an acknowledged world leader in stem cell research and in developing pioneering stem cell technologies, including the NYSCF Global Stem Cell ArrayTM and in manufacturing stem cells for scientists around the globe. NYSCF focuses on translational research in an accelerator model designed to overcome barriers that slow discovery and replace silos with collaboration. For more information, visit www.nyscf.org. ToolGen, Inc. (KONEX 199800) is a biotechnology company focused on the development and application of genome editing technologies. It creates and holds intellectual property rights for essential tools and technologies for editing the genetic information in microbial, plant, animal, and human cells. ToolGen’s mission is to translate the potential of its innovative platform technology into transformative products for biomedicine and agriculture. For more information, please visit www.toolgen.com. nSAGE, Inc (nSAGE) is the University-based biomedical company pursuing global industrialization of gene engineered stem cells and their related products using CRISPR/Cas9 technology in Korea. nSAGE has a long R&D history of proteomics and gene engineering in stem cells with global big companies. nSAGE’s core technologies are generation of primed stem cells and their exosomes through single cell level analysis. The major therapeutic target of nSAGE is macrophage and inflammation mediated intractable diseases.